Polyester resin is a synthetic material manufactured through the reaction between organic acids and alcohols. It can take several forms, including liquid, gel, and film, and has different properties that make it a useful material in many industries. Architects, builders, engineers, and designers all take advantage of the light weight, weatherproof strength of polyester resin in a variety of applications. Many home-building materials incorporate polyester resin as a source of lightweight strength. Prefabricated shower stalls and closet fixtures are often made of a mixture of polyester resin and acrylic, and decorative metal pieces are often gel-coated with a polyester resin-based colorant to match decor. 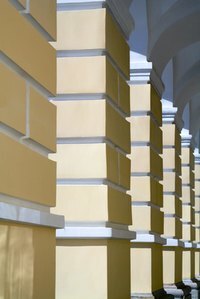 Many decorative architectural details such as columns and balustrades can be carved from hard foam, coated with fiberglass and polyester resin for strength and weatherproofing, and painted to match the building. Polyester resin’s adhesive property is sometimes used to adhere layers of fiberglass in the construction of body panels for automobiles, airplanes, and boats. Its light weight makes it ideal for racing cars and lightweight planes, but its high rate of water retention has caused it to fall out of favor with boat builders, and it has been mostly replaced in that capacity with epoxy resin. Even steel body panels are occasionally coated with a polyester resin-based colorant for decorative purposes. The ability of polyester resin to be dried into film and formed into sheets while remaining transparent makes it an ideal packaging material. As vacuum forming and heat sealing technology developed, new methods of packaging that used polyester resin as a base material came to the forefront, and still remain the most common forms of small-item packaging today. The same advantages that make polyester resin perfect for packaging also make it ideal for luggage. Suitcases and briefcases often contain polyester resin panels that are reinforced by fabric or leather to make them attractive. Polyester resin is commonly used to bond the fiberglass on the inside of many “wet” appliances, including dishwashers and washing machines. Despite the association with economy models, fiberglass and resin linings have the advantage over stainless steel interiors in that they do not ding and rust. The same lightweight strength that has made polyester resin popular in so many other applications also makes it useful for the manufacture of patio furniture. It also has the necessary qualities of being waterproof, weather-resistant and inexpensive to replace.